If there was an NFL Dictionary- if you would look up the word mediocrity you’d find the Miami Dolphins. Since 2001 they have only made the playoffs twice. Part of their problem is- while they have been missing out on the tournament- they are rarely awful- and getting a really high draft in return. Looking at their records in the past 16 years they have only one truly miserable season the 1-15 season of 2007. They had the #1 pick that year and took Jake Long who did make the Pro Bowl in his first four seasons with Miami but he was hardly a franchise changing player- or a face of the franchise player. The last time they won a playoff game by the way was in 2000. No wonder the Dolphins make Darius Rucker cry. I’d probably cry too if I were a fan of this team. With the 11th pick in the 2018 NFL draft the Miami Dolphins select- Baker Mayfield, QB- Oklahoma. 6 foot 216 4.84 in the 40. The Johnny Football of this years draft. He seems to have been doing and saying all the right things since the college football season ended and scouts are impressed. Mayfield is small. Very few small quarterbacks made it in the NFL- and those who do- like Drew Brees being the best example- an all time great- do in part because of the intangibles he brings to the table. Will the real Baker Mayfield please stand up? I am told that the Johnny Football comparisons really don’t stand up because Johnny wasn’t all about football- that Baker Football is about football and that he has a driving motivation to succeed and has succeeded brilliantly at the college level. In taking Mayfield at this pick I realize a better prospect is still out there on our boards- Josh Allen- but both Quinn and I do expect someone to move up in the draft to snag Allen. Mayfield could also be a good fit in Miami because he brings with him his star power. This team as I have mentioned has had no face of the franchise player really since Marino on offense. 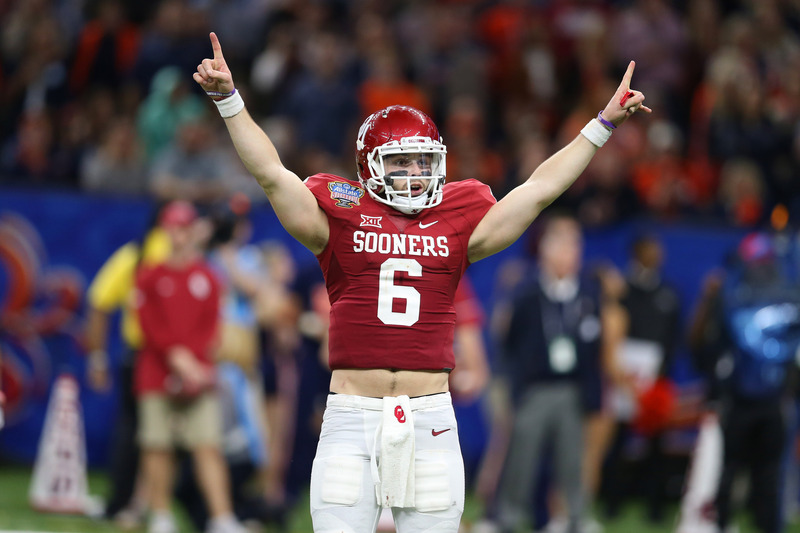 Mayfield is also probably closer to being ready for the NFL than Allen. Should be interesting to watch- there are many Mayfield fans out there who want to see him do well and many rooting to see him be Johnny Football Edition 2.0. He does need to grow his behavior at Oklahoma won’t cut it if he continues. I personally do not expect him to be anything more than an average quarterback in the NFL. Drew Brees is what he is because he is Drew Brees. Mayfield is no Brees at this point.